When the weather is warm it seems I’m only in the mood for light dishes, but I’ve found that eating light nutritious meals has become a way of life for me. It gives me more energy, my complexion looks better, my waistline is streamlined, and I’m happier, inside and out. I cook a lot, but you know that if you’re a frequent follower of At Home with Vicki Bensinger. While I typically cook dinner 5-6 times a week, the occasional burger or casserole, laden with cheese, does sneak in. I’m a huge fan of cheese so that truly is my downfall. 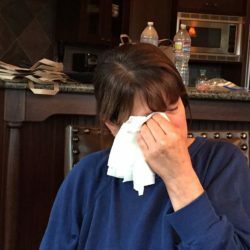 However, this summer while vacationing in Colorado I had no desire to eat any of those fatty foods, especially biking 3-4 hours a day. Farmers Markets were nearly at every corner, and the abundance of brightly colored fruits and veggies were screaming out my name. 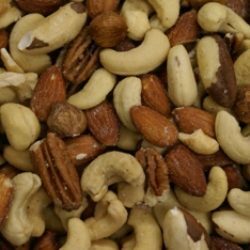 Of course, I have to squeeze in some protein for a well-balanced meal, which typically includes, fish, chicken and a nutrient-rich grain, like farro or quinoa. Most often I’d prepare bowls of fruit, greens, raw or grilled veggies with grilled chicken or fish, so my family could easily prepare a quick nutritious meal for themselves at lunch or for a nice family dinner buffet. Since each of our palates is different, variety is key. That’s what I love about Kraft Salad Dressings. Kraft makes a slew of dressings from classic favorites to light and fat free varieties, to dressing made with extra-virgin olive oil. There’s a salad dressing to satisfy everyone’s taste buds in your family. My favorites to pair with this meal are the Lite Raspberry Vinaigrette, Raspberry Balsamic Vinaigrette Dressing or Fat Free Ranch – YUM! I’ll add one of these to my salad for dinner, and for lunch place a portion of these ingredients in a whole wheat tortilla wrap, with a nice light drizzle of dressing, plus a small bowl for dipping. 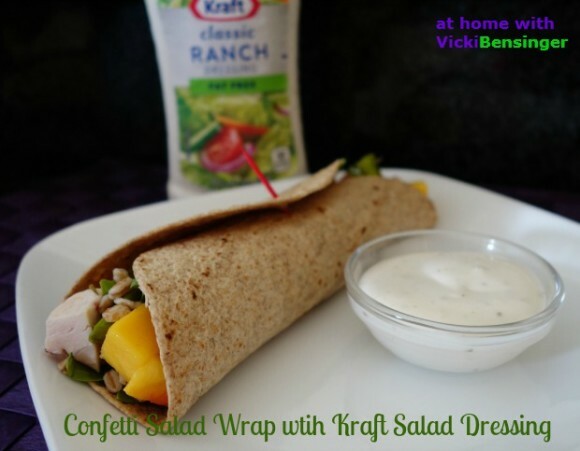 The Kraft Dressing is, “the icing on the cake.” It’s just what’s needed to make my dish perfect. Of course, ask my husband, daughter and son what they’re favorite Kraft dressing is, and everyone will have a different answer. 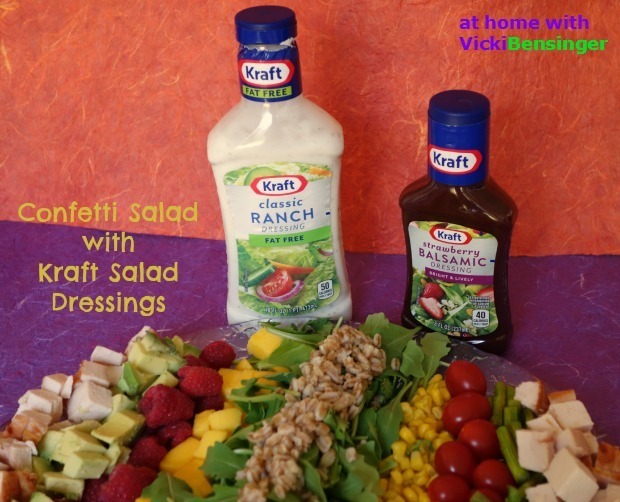 So when you’re looking for a vinaigrette or dressing to add to or jazz up a dish, be sure to check out Kraft Salad dressings along with their recipes – there’s one just for you! 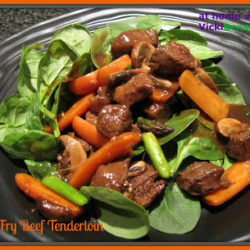 A light, nutritious salad perfect any time of year! 1. In a saucepan bring water to a boil. Add farro, cover and simmer for approximately 20-25 minutes. Allow to cool before adding to salad. 3. Select a delicious Kraft dressing of your choice, adding salt and pepper to taste, if desired. Toss and Enjoy!!! That’s a very beautiful and appetizing salad! A great idea to make a wrap with them. I love making salad wraps with any leftovers. Beats tossing all the goodies out and perfect for the next days lunch. 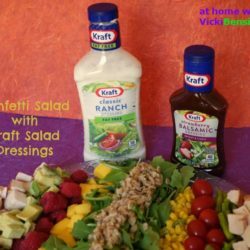 Such a gorgeous salad, Vicki. I’d be happy to eat it for lunch, then again for dinner. I’d have to make the wrap for Bill…he doesn’t seem to think salad counts for dinner. Crazy. Bill sounds picky like my husband although mine does love salads but oddly enough it seems he only eats everything but the greens. I wish too my husband would ask for salads at times. Maybe he would enjoy it with your delicious sounding dressing. I think kids would love this. Mine do but then again they’re in their 20s but did enjoy salads when they were younger too. It’s very flavorful. I hope you’ll try it with one of Krafts delicious salad dressings. Such a pretty salad Vicki. I love all the vibrant colors. 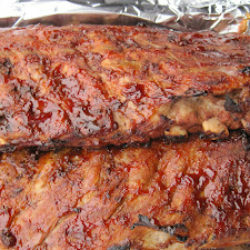 I could definitely enjoy this for lunch or dinner. I agree, when a brightly colored plate of appetizing food is put in front of you it’s not just pleasing to the eye but the palate as well. I love using what leftovers I have into a wrap plus it’s great to bring to work as well or to pack up in the kids lunch boxes. I hope you’ll try it. We’ve been eating salads like crazy lately! This looks terrific — good dish. Thanks. 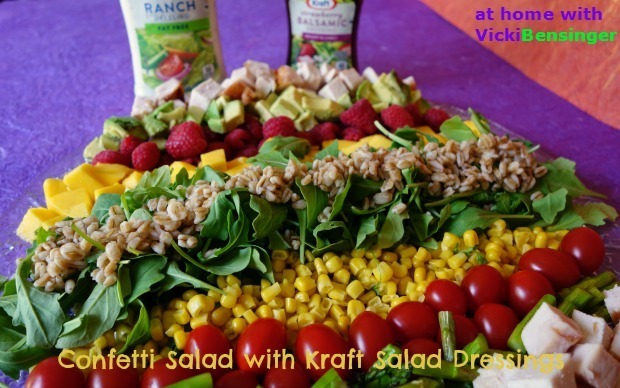 Love all the vibrant colors in your confetti salad! Looks terrific!